Easter in the Greek Orthodox community is just as holy and delicious as the Roman Catholic holiday celebration. Enjoy Greek Easter Sunday with twists on traditional and tasty Greek foods like roasted olives and grilled halloumi. Christos Anesti, everyone! Grilling a whole fish is easier than you might think, and the result is a super-impressive centerpiece for a summertime dinner party. Whether you go big with a snapper or single-serve with trout, F&W has the recipes you need. Here, nine delicious ways to grill whole fish. This incredible, flaky, tender snapper is coated in a crispy bread crumb crust. Grilling fish like red snapper in banana leaves keeps it ultra moist. Tilapia is super versatile. Here, Andy Ricker stuffs whole fish with lemongrass, encases it in a salt crust, and cooks it over a charcoal fire. Tom Colicchio likes to grill a show-stopping whole sea bass with Asian flavors with cilantro, lime and hot chile sauce. 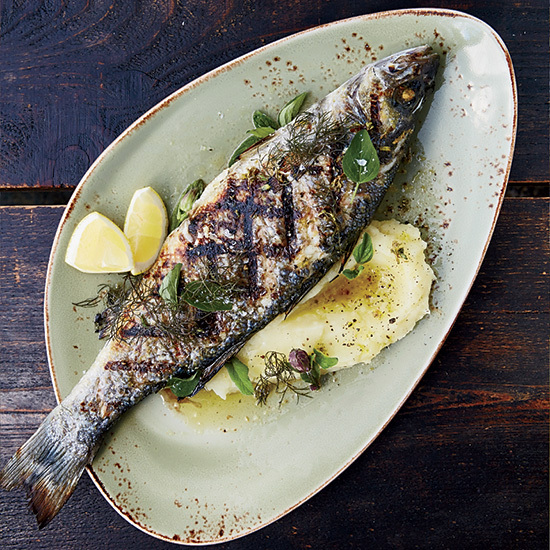 Smoky, grilled branzino is fantastic with a superlemony Greek ladeolemono sauce and a tangy, garlicky potato puree. Sauce au chien is like an exotic vinaigrette made with herbs, aromatic vegetables and lime juice. It’s a lively, pungent and spicy complement to all kinds of grilled foods. Drizzling moist and tender grilled snapper with an Asian vinaigrette is easy and utterly delicious. Sardines are great fish to grill: they cook quickly, and because they’re oily, they’re harder to overcook than delicate white fish. It doesn’t get much simpler than this super-easy recipe.